Question of the Week: What beauty item(s) are you most happy to have purchased before it was discontinued? Answer :- A couple of things, both of them NARS. 1). My NARS Crazed blusher because it’s such a HAWT flush of colour, pigmented like hell and when I get the heavy-handedness toned down, it looks lovely and 2). My NARS liquid eyeliner in Bullit – do you remember them? They used to come in little glass vials that you’d dip a brush in? Well, Bullit is the most crazy beautiful taupe/silver/bronze… gah, just stunning. 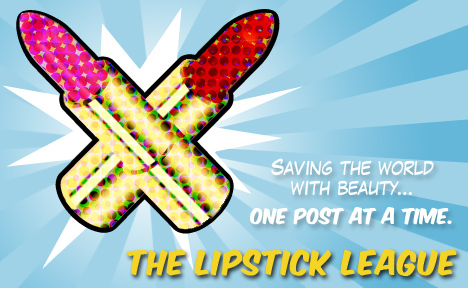 Lipglossiping – injects some fun into her beauty routine with Urban Decay’s latest mini-palette! Gouldylox Reviews – This curling iron is part magic and part mystery. I don’t know why the curls last for DAYS, but they do. Check out the pictures for proof! Nouveau Cheap – I’m so obsessed with my current favorite lipstick (retail: $6) that all of my other lip colors seem to be collecting dust right now. Pink Sith – wants to know if you see the same thing that she sees when she looks at the Lise Watier Glamour Rose Illuminating Face & Body Powder. Prime Beauty – got into a little skirmish recently with her fellow bloggers. See what she chose as her mascara warrior in Makeup Wars-Battle of the Best Mascara. Phyrra – tells you how she thinks mascara should be advertised! Vampy Varnish – really likes the new Buxom Time to Shine Lip Collection for the holidays! Beauty Junkies Unite – See Amber’s 6 recent product picks for total complexion perfection! Clumps of Mascara – tried CoverGirl Lashblast Clump Crusher mascara and whoa…it shocked her! EauMG It’s that time again. Gift guide time! Here’s EauMG’s Holiday 2012 Gift Guide for Vintage Beauties. Guest Post of the Week, as chosen by Lipglossiping – Cafe Makeup ensures that Chanel’s Liquid Eyeliner in Platine secures itself a place on my Christmas wishlist! What beauty item(s) are you most happy to have purchased before it was discontinued? Thats a tough question! I have a could of LE items- im not sure they count. Chanel mat lumiere is possibly one. Oh and bourjois coupe de theatre dual ended mascara!